NO4 AAKG! Get PUMPED... to the MAX! 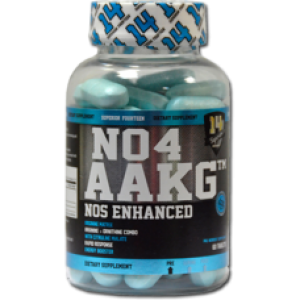 NO4 AAKG is a NOS enhanced Pre-Workout Supplement featuring a high quality Arginine Matrix and an Arginine + Ornithine combo with Citrulline Malate. NO4 AAKG will change your training… it helps you to recover faster and gives a pump experience that you could not imagine before. NO4 AAKG is a unique supplement matrix which reinforces the recovery of the muscles, by supplying a better circulation in the vascular system.